The March/April, 2010 issue has been cancelled. We plan to return to our publishing schedule with an expanded May/June, 2010 issue. The March/April “Editor’s Choice” sampler CD for subscribers will be included in the May/June issue. Subscribers will still receive the same number of issues. Sales of back issues and single copies have temporarily been suspended while our business office relocates. Sales will resume once the relocation is complete. Pop culture interviewer Tim O’Shea asks Dirty Linen editor Paul Hartman questions on Talking With Tim. 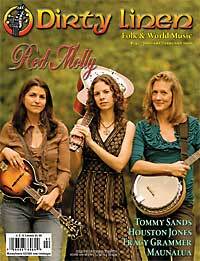 The new issue of Dirty Linen, the magazine of folk & world music, was mailed to subscribers on Friday, September 11th. Please allow 3 days to 3 weeks for it to arrive. It will be onsale on newsstands on Tuesday, October 6th. Subscribers also received Dirty Linen “Editor’s Choice” Sampler CD #6. This collection of new music is not available in newsstand copies or back issues. It’s a free bonus to subscribers only. The new issue of Dirty Linen was mailed to subscribers last week. It will show up on newsstands around June 9th. Jackie Greene, Missy Raines, Genticorum, Susan Werner, Jonathan Edwards, Ian McLagan, Rose Polenzani, Frank Critelli, Unearthed: James “Iron Head” Baker, The All New Electric Muse, Wee Folk, Dirty Linen “Editor’s Choice” Sampler CD #5, concert review, recording reviews, book reviews, DVD reviews, news. 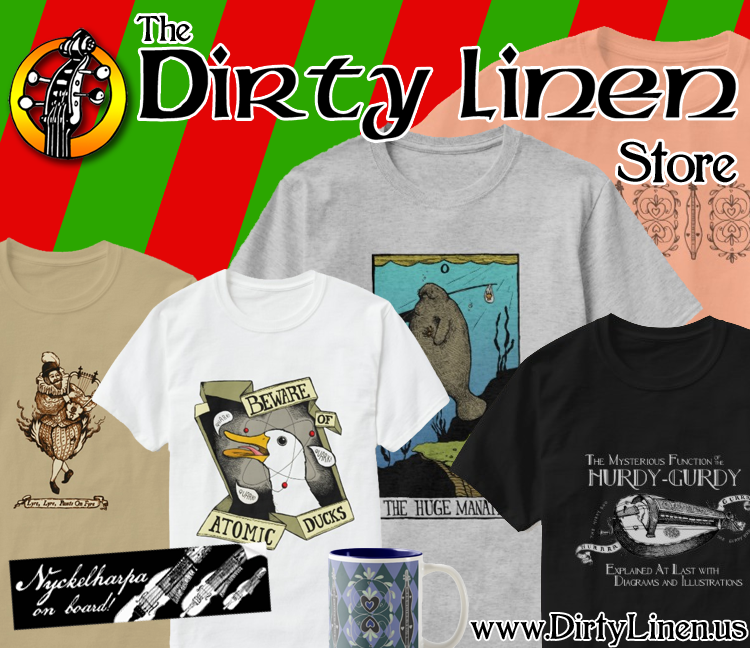 Excerpts from the new issue of Dirty Linen have been posted on our website. Available by subscription, at our webstore, and at only the finest newsstands (after April 14). The Dirty Linen Gig Guide by-artist and by-state listings have been updated for March. Excerpts from the new issue of Dirty Linen, No. 140 – March/April 2009, are now on our website. Features include Terrance Simien, Patrick Ball, Julie Fowlis, Cadillac Sky, Gyuto Monks, Maria Muldaur, Donna the Buffalo, Vinyl Valhalla: Whippersnapper, Psych Folk, Bob Gibson Reissues, Wee Folk, Dirty Linen “Editor’s Choice” Sampler CD #4, concert reviews, recording reviews, book reviews, DVD reviews, news.